The full moon occurs on Thursday, September 19th in the nakshatra of Purva Bhadrapada, a set of two bright stars that exist within the constellation of the pegasus. This constellation is a culmination of Jupitarian energy. Jupiter is a benefic planet and is called the great Guru because he has the most moons or most disciples. He creates expansion on a deeply spiritual level while increasing wealth and philosophy. Purva Bhadrapada in Sanskrit means the auspicious foot. It is symbolized by the two front legs of a funeral cot or bed, a sword and a two faced man. The funeral cot or bed represents our exit from this material world. It is closely tied to the idea that sleep is a temporary form of death. Deep dreamless sleep grants us the ability to subconsciously see our true unitive selves. This concept is illistrated in the deep sleep state that exists in the third syllable of AUM which is called Prajna. The sword is affiliated with the ability to cut things off, indicating that death is necessary for rebirth. Purva Bhadrapada is also considered a two faced man. One face is serene and the other is full of rage. This represents how human nature can be two fold. We can put on a front of happiness even when our true character is strewn with demons. 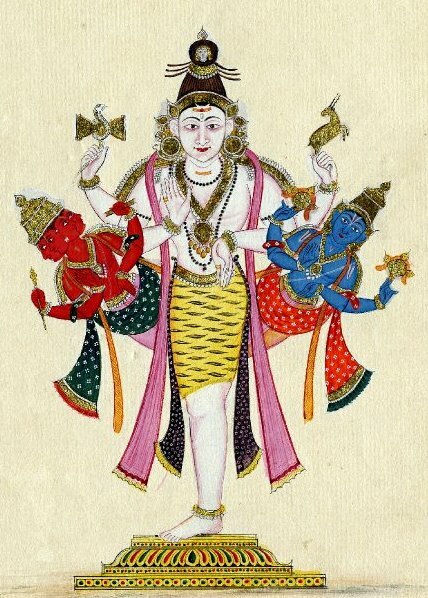 Purva Bhadrapada is ruled by the diety Aja Ekapada, “the one footed goat”. He is part of the entourage of Rudra, The God of Storms. Rudra is one of the fiercest forms of Shiva and has a destructive nature. Thus Aja Ekapada is associated with black magic and card #15, the Devil, in the western Tarot pack. However, in the Vedic perspective the negative destruction that this nakshatra can create is eventually divinely ordained. Aja Ekapada is a transport vehicle for Agni the God of fire. Agni helps transform what has fallen into decay into life and vitality. We also have the transformative energy of Yajamana Vdyamana Shakti on our side. This energy has the power to raise a spiritual person up in life. Face your demons and burn them up to uplift humanity. This a time of great change. Embrace it. Remember we are all humans, but we need to strive to be better ones.